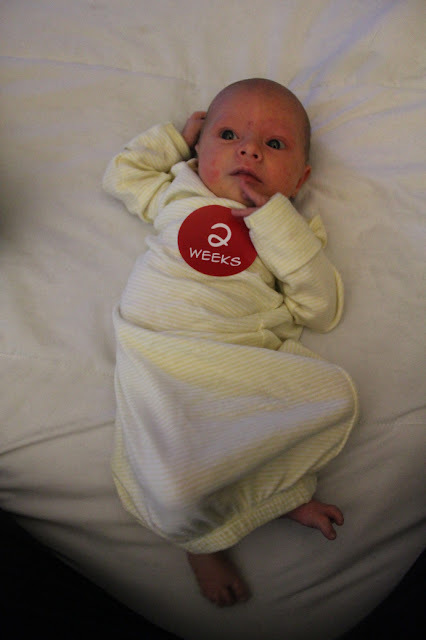 You are two weeks old, munchkin! And it's so hard to believe you have only been here for two weeks. Even harder to believe you weren't actually supposed to be here until today. Today would have been my inducement date, but instead we were blessed with two bonus weeks with you. They have been exhausting. You still have your days and nights a little confused, and you don't really like sleeping in your port-a-crib at night, which makes for long nights for your dear mama. But they have also been two of the best weeks of my life. It's hard to believe that just three weeks ago you weren't in our lives. You have been a great little eater, although you seem to be doing that all the time these days, which means I can't go very far from you. But you are my tiny little girl, and we want you to keep on growing so I just keep on feeding you when you want more. Even though you get confused about sleeping and which are days and which are nights, you still do a lot of sleeping. Right now, you are a pro at both eating and sleeping.